It is a humble, everyday scene of seventeenth-century life. In the middle of winter, the rivers are frozen over: the children are enjoying themselves skating, while the grown-ups talk business and family, and generally get on with life. The painter, Henrik Avercamp, captures the hustle and bustle of the rural community as it carries on through the hard months. He captures as well the leaden skies which seem to shut in the community, echoing the greyness of the frozen water. A viewer in the twenty-first century might look at this painting as nothing more than the equivalent of a tourist’s snapshot, a quick capturing of an incidental scene that just happens to be going on as you pass by. The work, however, is not an arbitrarily taken snapshot: it is carefully constructed, with people and objects arranged to guide the eye along sightlines in various directions, scrupulously obeying the laws of perspective. It speaks of an ordered universe, in which everyone and everything has its place. In the aftermath of the brutal Thirty Years’ War in which the Dutch finally threw off the yoke of their Spanish oppressors, it maybe unconsciously celebrates the joys of peace and freedom. It also speaks, again perhaps unconsciously but nevertheless powerfully, of the sacredness of everyday life, which was one of the great ‘discoveries’ of Calvinism. Paintings in the western fine-art tradition usually involve an expression of the fundamental commitments of the artist or of his/her community. They convey, explicitly or implicitly, an understanding of what reality is about, a view on what makes us tick as human beings, a recognition of our ultimate values and the things we hold most sacred. Sometimes it is very overt, as in, for instance, religious imagery. Sometimes it is subtle; and sometimes it is an unconscious expression by the artist of the prevailing worldview of their culture. Even such an apparently humble image as Avercamp’s painting of peasants on the ice is no exception. Expressed through this painting is an understanding of the world which is fundamentally Protestant. This can be demonstrated at the most basic level by the fact that no Southern European artist of the time, influenced by the philosophy of the Renaissance and the theology of the Counter-Reformation, would for a moment have considered that Avercamp’s scene was worthy of being painted. For the southern Europeans, brought up in a Platonic view of reality, the everyday material world was inherently imperfect and sinful, only a poor copy of the pure reality which lay in the ‘spiritual’, non-physical realm. To find the pure, noble and spiritual therefore one had to escape from the gross material reality of our daily existence, and move in our thinking and aspiration towards a disembodied realm of what was believed to be the ‘spiritual realm’. Southern European artists therefore tended to paint idealised figures. These could be etherially beautiful Mona Lisa, who sits in perfect calm against an imaginary landscape. Or it might be super-human bodies of the youthful Michelangelo on the Sistine Ceiling, whose perfected physique was believed to be evidence of the purity of spirit within. It might involve scenes from pagan mythology, embodying human aspiration; or Bible stories told through figures who were imaged as perfect beings because they were ‘holy’ saints. Peasantry would be treated at best in a condescending manner, and again in an idealised, obediently unthreatening state. The showy, in-your-face realism of Caravaggio was the first serious departure from these assumptions. In the Protestant mind, however, the physical world is still inherently the good creation of the good Creator God, who declared it to be very good. Even though marred by sin and God’s curse on nature, the world still matters to God, and one day he will renew it and purify it for ever. Also, for the Protestant mind, ordinary individual people matter to God. They are not the ‘great unwashed’ hoi polloi, who exist in a lower caste from the enlightened philosophers and poets, whose clean hands betokened a cleaner spirit that was closer to the gods. Instead, the Reformation reminded us that every individual creature is made in the image of God, made to know and worship God for themselves through faith in Christ, and enjoying the promise of resurrection and eternal life with Christ. Everyone is equally sinful, and everyone is equally valuable. We do not know how consciously Avercamp had such thoughts in mind as he painted the picture: probably very little. But Protestant theology underpinned the culture of the Dutch seventeeth century, and everybody imbibed a lot of it, whether they themselves were committed Protestants, continuing Roman Catholics, or uncommitted journeymen out to make a living from their skills. As Avercamp’s figures skate or stand, watch or talk, eat or drink they are all taking part in essentially sacred activities, ones worthy of being captured in art because they are worthy of God’s attention, able to be offered to him in worship as part of the rich lives he has created us to live in obedience to him. Does contemporary art still fit this definition that it is an expression of worldviews and ultimate commitments? Certainly, if the artist is any good, because people can’t help but express their commitments and values as they express themselves. Sometimes they are the explicit subject of the work – such as some of the pickled animals by Damien Hirst and his works which overtly relate to Christianity. Hirst’s pondering on our ambivalence towards death expresses perfectly the contemporary belief that there seems to be no meaning to life, but at the same time the nagging sense that that belief is at odds with our own experience of life, and indeed with our hope that there is a meaning and purpose in our lives. For much of the nineteenth and twentieth centuries, as the shortcomings of the Enlightenment have been experienced if not understood, much art has focused on a basic understanding of what is real. In this, the artists unconsciously expressed the worldview of their culture. For the Impressionists reality was determinable through sense perceptions; for the Surrealists and Abstract Expressionists it was the unconscious mind; for some of the abstract artists it was a vaguely perceived spiritual realm. Towards the end of the century, and with the rise of the ‘me’ generation, the search for reality focused increasingly on the artist’s own self, their life and, often, their own body. Tracey Emin’s My bed, the work which brought her such notoriety when included in her Turner Prize exhibit in 1999, is a good example. The almost compulsive self-revelation in this work, in all its honesty and abjection, seems to reflect an absence of any sense of transcendence, or indeed of meaning, beyond the bare existence of the everyday artefacts of her life. At the same time, she seems to view these with a degree of distaste which should betoken a sense of there being another dimension to our existence, which recognises degradation and does not perceive it as an acceptable normality. It is a conflict that you would expect to find in an honest artist working to make sense of their life, but without the benefit of the revealing light of the gospel of Christ showing how the many part of our fallen lives make sense together. 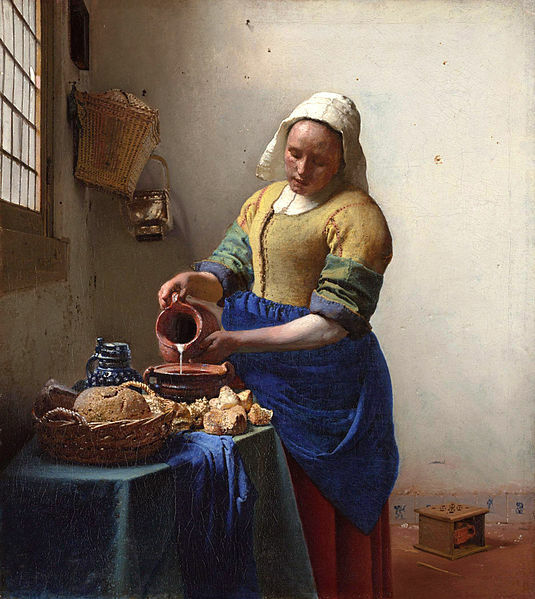 A Dutch artist of the seventeenth century, such as Vermeer, was able to take a similarly direct and honest view of the everyday details of life, but see in them a real significance, order and beauty, because they fitted into a view of the world which is consonant with reality: that God has made us and the world in which we live; he loves us and it despite our sin and its effects; and he intends to redeem for ever his people and this world, in which they will continue to live. That sense of the intrinsic value of the ordinary shines through powerfully in these old paintings of everyday life, as they view the world through the eyes of faith. First published in Affinity Bulletin, November 2008.